Very varied. That's the theme for this week's Topaz Fashion episode! I'll show you what I wear on different occasions. I'm wearing a batwing-sleeve shirt from Ojay, Guess skinny jeans, Lacoste leather ballet flats and a Frances Sales satchel. I still like calling it that—the Frances Sales satchel. 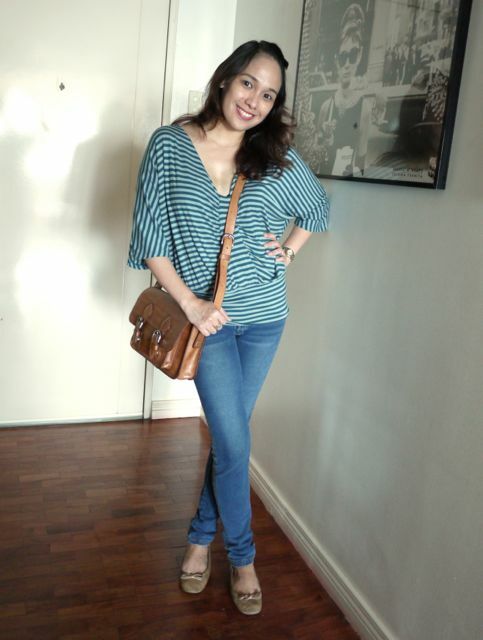 Anyway, this is brainless dressing, just jeans and a top. But I got a really large shirt to go with really skinny jeans because I like opposites that way. Oh, and the secret to not look fat in a big top? Make sure it has a shape. Whether it's a cinched waist or the hem is tapered to hug your hips. Also, get a top with a plunging neckline. The deep V cuts you in half so you don't look so wide. a) It looks like a blouse and a skirt but it's actually one dress! 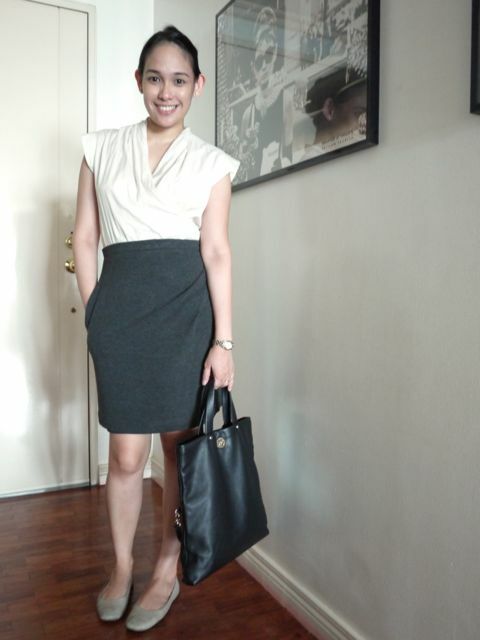 c) It looks so crisp and business-like but it's so comfortable to wear. I was supposed to wear a pearl choker and pearl drop earrings with this, by the way, but I rushed out of the house completely forgetting to accessorize! 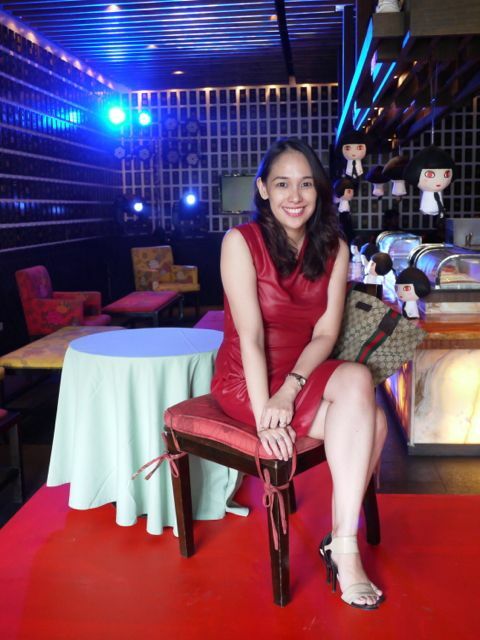 I'm wearing a K & Company dress, Sapato Manila heels and a Gucci shopper. I was supposed to use my Fino structured bag but I came from work (that Gucci is stuffed with magazines!) so I had to use a big bag. Oh, and again, I forgot to accessorize. I'm not even wearing earrings! Ladies, never leave home without earrings. They decorate your face. Anyway, style tip: Dresses are best complemented with a structured purse or a small clutch. Think Victoria Beckham and Duchess of Cambridge. I knooooow. This Topaz Fashion edition is a Fashion Fail. No accessories. Wrong bags. Awful! Haha. I'll make up for it next week! Happy weekend! I can totally relate with the bags and accessories amnesia — I'm like that. I hardly look "all together" because I often forget to use the right accessories, or even put on makeup. I usually never forget jewelry. I love jewelry! I always forget makeup. I hate makeup! I think this is the first photo I saw of you in jeans! But the plunging neckline is... WOW. Buti Vince let you out the door. ;) Hahaha! Oh, by him letting you out the door, I meant wanting to get you back into bed. Hahaha! I hardly ever wear earrings. I think it drives my mother nuts. Back in college, my husband (then-boyfriend) would wear them more often than I did, and would wear more earrings than I did (he had more than one piercing on one ear).